To set the stage, the Lumix LX100 is a 12 MP camera that uses a 16MP sensor. As the camera can be configured for 3:2, 4:3, 1:1 and 16:9 aspect ratios, Panasonic has been successful is maintaining 12MP per frame utilizing portions of the 16MP sensor to its max. The LX100 is a small fixed lens camera and you can get the specs here. Many questions have been asked about Micro For Thirds (MFT) cameras and their ability to produce images ready for large prints. Keeping in mind that a majority of images these days are created and shown on computer screens and small portable devices. The maximum image size for the printed page for a magazine is 8.5 by 11.0 inches and for a double page spread 17.0 by 11.0 inches with a resolution of 240 to 300 DPI. So last weekend I shot a few images with the Lumix LX100 hand-held at a casual photo shoot. The lights were set for ISO 100 and f/8.0. Focal length 34 mm which is a 68mm equivalent. Here is one image cropped from the original size of 3456 by 4608 pixels to 2284 by 3416 (roughly 7.8MP or 2/3 the resolution of the effective sensor. Click on the image to see it full resolution. Next, I up-sized this image to 30 inches by 44 inches at 300 pixels per inch. The following image is a 5 by 7 aspect ratio crop 1165 by 1631 pixels. 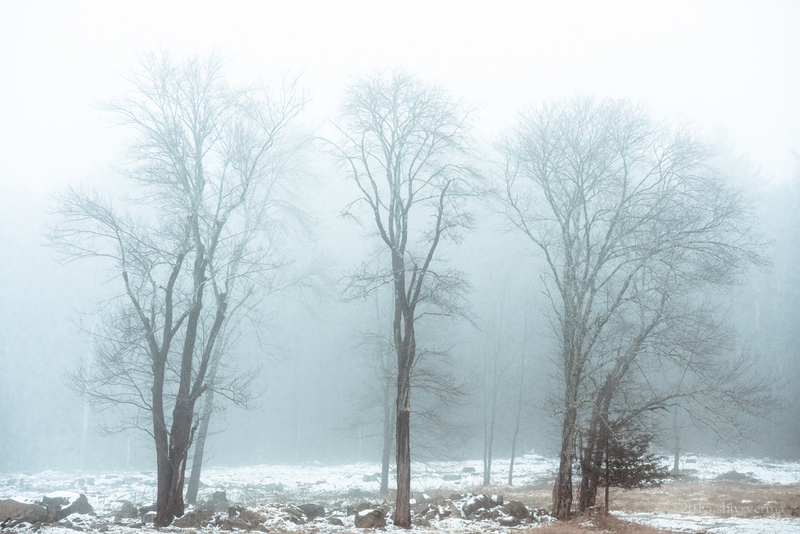 Feeling good, I resized the original crop to 60 inches by 90 inches at 240 pixels per inch. The final image is a 5 by 7 aspect ratio crop of a similar section 2148 by 3007 pixels. Resizing was accomplished using OnOne’s Perfect Resize. No post processing, sharpening or clarity adjustments were made to the resized images. All OnOne defaults were left as is. Some degradation is apparent but as a result of jpg conversion. Hope this dispels the myth that a MFT image can’t be made into a large print. Canon also released its earnings report for Q4 2014. Click here for the report. Of significance is the fact that Canon’s imaging sales in the America’s had the greatest decline of nearly 12% year over year. From to 392,373 billion Yen in 2013 to 345,707 billion Yen in 2014. As per a post on the Adobe blog yesterday, Lightroom 6 when announced will only work on 64 bit platforms. This means Mac users must be on OSX 10.8 or above and Windows users must be on Windows 7, 8 or 8.1 64 bit. 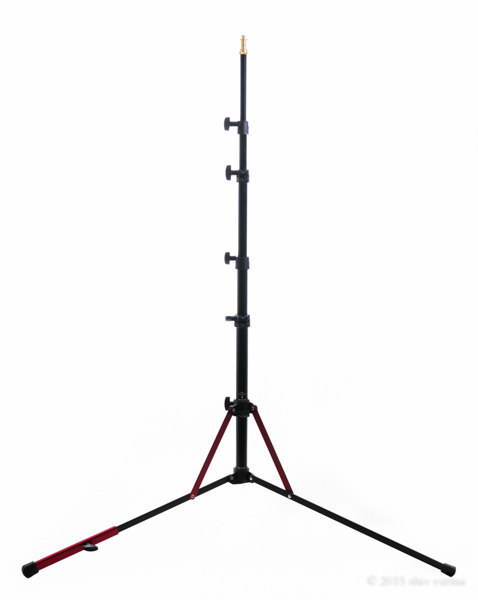 If you are looking for a lightweight, compact and portable light stand for studio or location shoots using a speed light this is your answer. 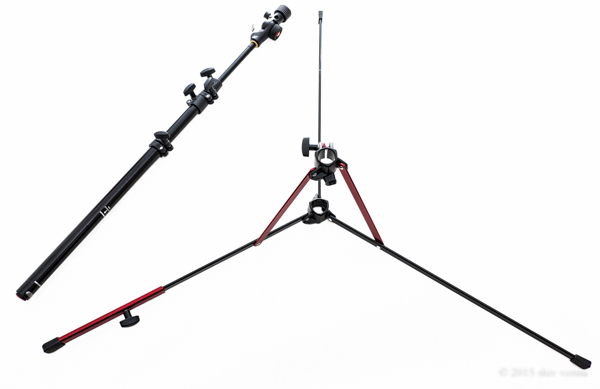 The Nanopole is a lightweight and compact stand for flash heads and and modifiers weighing under 3.5 pounds It will extend to 6′ and has with a removable riser section that can be used as a boom-arm for hand held or clamped positioning. The stand has reverse folding legs allowing it to fold down 19.3″ for packing. 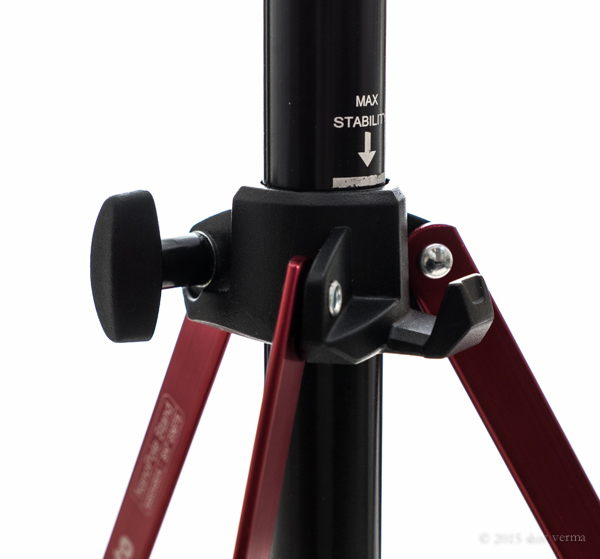 The Nanopole possesses a couple of features which make it stand out from many other light stands. It has a convenient hook to secure sandbags for additional stability. One leg is extendable to permit leveling on uneven surfaces. Note however, it will not level on stairs. The riser is easily detached from the legs by a simple push on a release button on the bottom of the pole. The Nanopole is ideally suited for indoor and outdoor photography and has some visual appeal too. The red anodized accents and logo give this stand a bit of pizzaz. The Nanopole sells for under $80. The Snap Tilthead with Shoe Mount from Manfrotto is new and unique yet very handy way to mount your flash off-camera. You can use the flash with an umbrella or a small softbox. Unlike most swivel adaptors the Tilthead does not have any large extended levers and locking handles and is easy to pack and store. The Tilted fits all nightstands with 5/8” stud and has a unique spring loaded locking lever. 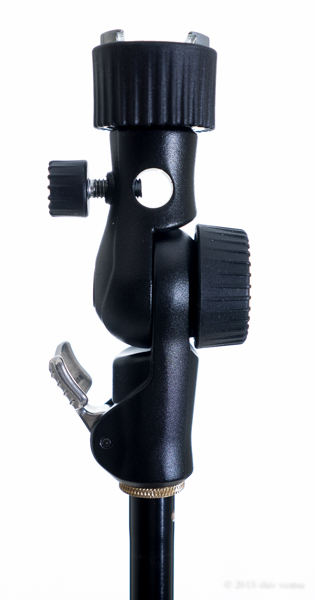 The Tilthead has an auto-locking knob for angle selection with a built in spring loaded counterbalance mechanism. This prevents the the flash from tipping into the stand. The shoe mount loosens and tightens via collar that requires a single twist. The Tilthead will accept all standard hot shoe flash heads. The Tilted sells for under $40. The two devices together make an excellent portable solution. With the exceptional Aurora Borealis activity in Iceland, I am doing a 1 week photo tour and workshop that will be exceptional. 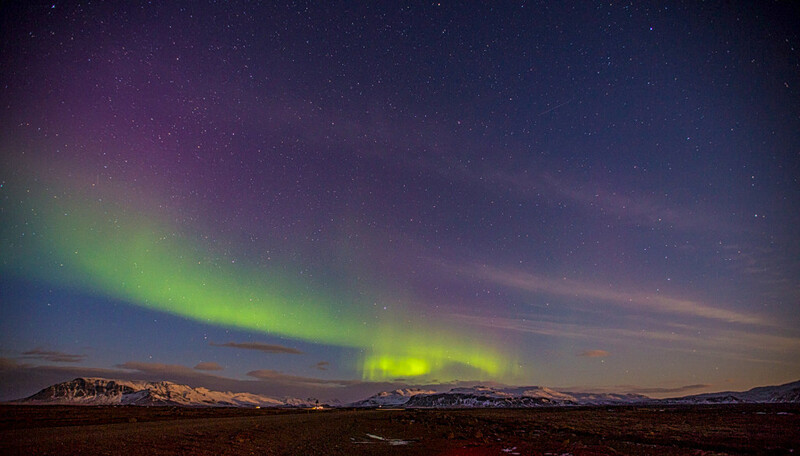 From the western peninsulas of Snæfellsnes and Reykjanes to the exceptional south coast including the exquisite black sand beaches and icebergs in Jökulsárlón and surrounding areas this trip is designed for all levels of photographers. This trip is limited to a maximum 7 participants. All Iceland photo tours and workshops in 2014 and 2013 were fully subscribed within days so please register as soon as possible. CES 2015 officially opened today January 6, 2015 but most of the key product announcements were made yesterday. 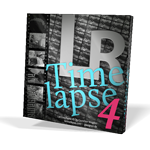 Here is a quick roundup of photography related products. Some WOW and Some (I don’t know what to say). My big question once again is – What’s up with Canon and Nikon. Sadly Canon announced not much. A camcorder update to three of its consumer targeted models. A round of PowerShots, 2 ultra compact cameras and 3 mega-zooms – Oh well so much for Canon and innovation. One more, a Connect Station that is 1TB media gizmo for offloading content from cameras. “Canon Connect Station CS100, a photo and video storage device that has the capability to connect to multiple compatible imaging devices allowing users to easily store, view and share images and videos” from the Adorama web site. Was this gizmo so important? Particularly since there are not many Canon Cameras that can take advantage of the NFC feature. Nikon too, lackluster, announced a D5500 3.2 inch touch screen and not much more with this model as the update to the D5300 – coming into the real world finally. In addition Nikon introduced a light 300mm f/4 lens the AF-S Nikkor 300mm f4D IF-ED. This is an image stabilized lens and uses technology that is similar to Canon’s DO (diffractive optic-element) lenses. Nikon also announced a slow collapsible 55-200mm f4-5.6 consumer lens. Fuji film announced their 16-55mm f/2.8 lens as per their lens introduction schedule. The lens is optimized for the XT-1 and is weather sealed. Unfortunately it is not image stabilized. Panasonic introduces the Lumix ZS50 with 30X zoom and follows Sony with downsizing megapixels from 18 to 12 for better low light performance. Also introducing a few camcorders and a few full featured 4K/UHD versions. Anther great introduction but shown in Beta is a 4K capable Blu-Ray player. 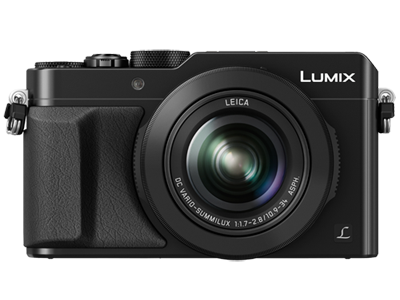 Best of all the Panasonic Lumix CM-1 Smart Camera (A Camera Phone or a Phone Camera) introduced last year at Photokina will be released in the US this summer – more here. Sony blasted its own flurry of 4K video products. A prosumer 4K/UHD handy cam the FDR-AX33 that breaks the $1000 barrier. A new Action Cam the FDR-X1000V with 4K video and enhanced image stabilization. Though not a camera or camcorder but photography related, Wacom announced a few new models of its Windows 8 tablet/secondary desktop display along with a couple of larger desktop Cintiq displays. My picks for whatever it may be worth are the Panasonic CM-1 and the Wacom Cintiqs. Photography Post-processing – Which Tablet would you recommend? This post is in response to a question I was asked yesterday. In my opinion and having used a tablet for the past 12 years or more I would say that if you draw or retouch using your computer you need a tablet and a pen. Not only is the pen more ergonomic but it is far more natural in the way you position your hand and fingers compared to the award two or three button mouse. The mouse is fine for basic painting and clocking. Anything more and it just does not cut the mustard. Though the tablet and pen is not an essential tool for photographers it becomes essential if you do any retouching, masking and digital art. So the question about which tablet should a photographer get can be answered in a few ways. Undoubtedly the Wacom is the finest tablet in the market. There are others but I would stay away. You want a tablet that is well designed and works. For any peripheral device one of the key considerations is the software interface and the drivers. Here Wacom excels. The size of the tablet you used should be based on whether you are a single or dual monitor user. For single monitor users, my suggestion is the small or medium Wacom tablets. For dual monitor users the choice is the large or the extra-large. The reason for the large are larger tablet is because you can map each monitor to two halves of the tablet. 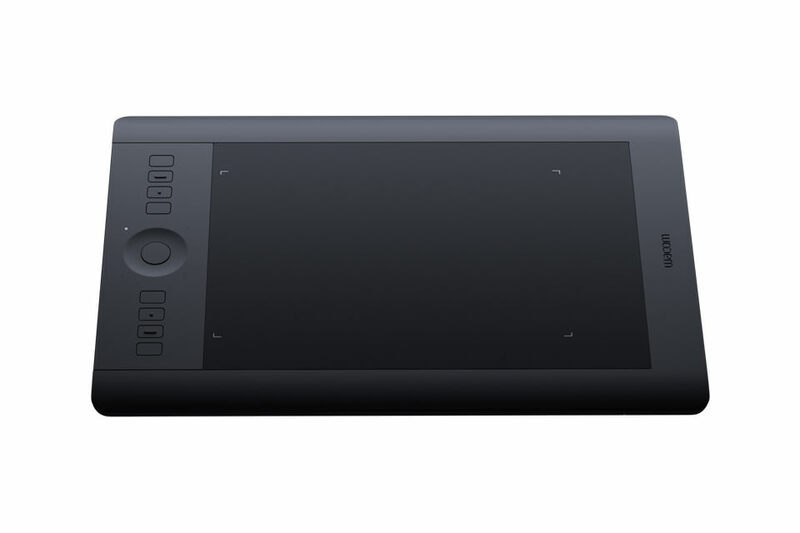 Wacom makes three tablet products. The Bamboo, The Intuos Pen and the Intuos Pro. As a photographer I would stay away from the Bamboo as I feel it is a touch pad and with the stylus great for doodling. So the choices are the Intuos Pen or the Intuos Pro. Both can be connected via USB or wireless. 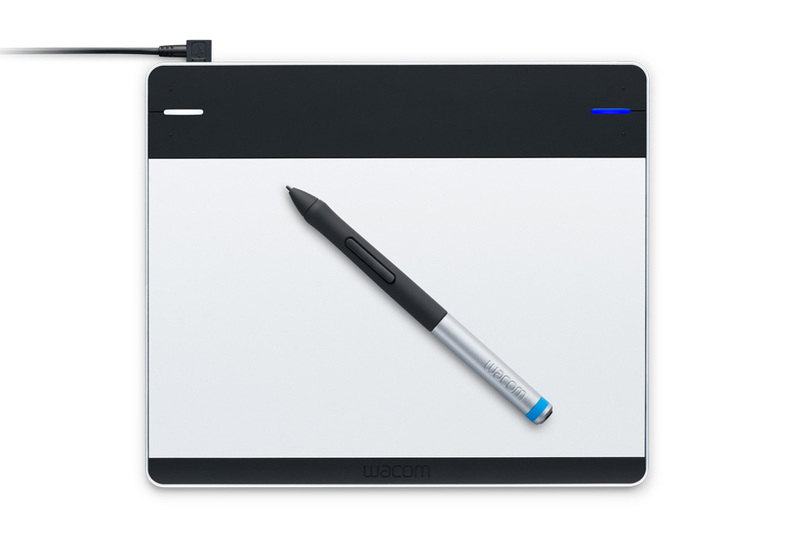 The Intuos has touch sensitivity in all models while the Intuos Pen has an optional touch version. Wacom Intuos Pro is highly customizable. It has 8 buttons and a multi-functional touch ring and two buttons on the pen. 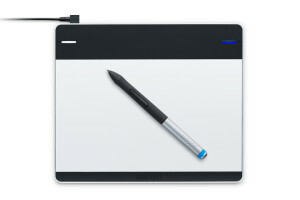 The Intuos Pen has 4 customizable buttons in the top panel. With the Intuos Pro each of them can be assigned a different custom feature – from scrolling, panning and zooming to keyboard shortcuts and changing brush size. You can also use the tilt feature to change brush shapes. A Shortcut Menu can be assigned to one of the buttons and when clicked a circular menu will show on the screen. This menu system gives access to several additional shortcuts than can be layered. Another great feature is the ability to set and customize buttons by application. So Photoshop can have its own custom buttons and Lightroom its own, etc. Pressure sensitivity is always questioned. If you use Photoshop that recognizes pressure sensitivity then the choice is the Intros Pro with higher levels. You will notice the difference only when comparing the two tablets side by side. 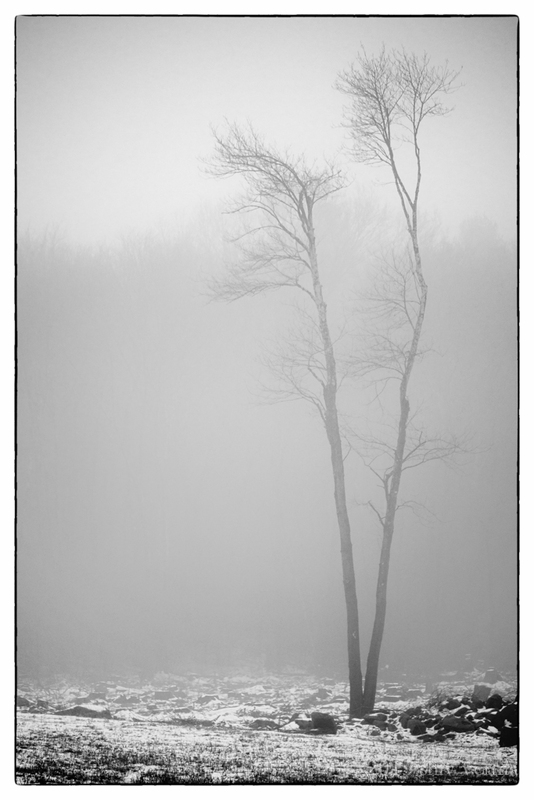 If all you use is Lightroom then you do not need the greater pressure sensitivity and the Intros will serve you well. Intuos Pro also supports hand gestures that are customizable too. You can pan, zoom and rotate using gestures. This feature can be enabled or disabled as needed. In my opinion the Intuos Pen is ideal for beginners. This is a very good tablet for drawing, painting and photo editing. The Intros Pro on the other hand is one of the best in tablets. The difference in price is fully justifiable. This is a tablet for photographers who do a lot of post-processing, image retouching and work extensively with layer masks. Precision cloning, masking, dodging and burning, is controlled yet simplified. Of importance is the fact that you are unlikely to outgrow the features this tablet provides. Wacom also make the Cintiq family of high definition pen monitors that are exceptional.